Learn which features make upCastRT one of the best document conversion pipeline building tools available on the market today, in particular for Word and RTF content. 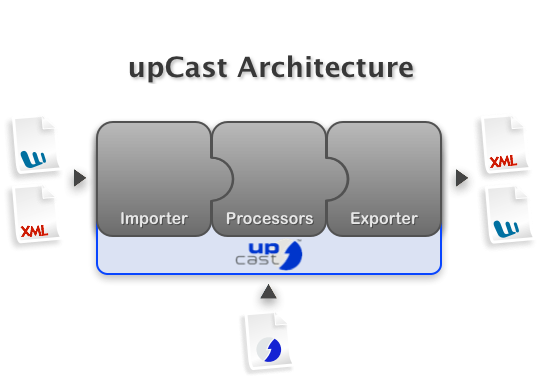 upCastRT is a module-based document processing pipeline tool, specializing in legacy, "flat" and layout-driven content. It comes with pre-defined, configurable, task oriented modules that you can create arbitrarily complex processing pipelines of. Usually, a conversion is a three-phase process: You import the source data into the application, process the data, and export the result. Sometimes, a fourth, external post-processing step is added. upCastRT offers various modules, which can be divided into three different classes: Importers, Processors and Exporters. Setting up conversion pipelines is a tedious task. This is specifically true for flat, layout-heavy, structureless source content (legacy content). A conversion often requires a chain of multiple transformations and very specific processing operations. upCast RT offers a flexible, easy-to-use UI to set up, test and debug such piplines. A clever architecture allows you to create location-independent setups that can be easily transferred from one machine to another. For deployment in an automated environment, upCastRT allows you to export finished pipelines as Java source code or Ant task definitions. upCast RT comes with a set of highly specialized modules targeted at the task of structuring flat content quickly. This includes the upCast Processing Language featuring innovative operations like creating markup based on style properties or regular expressions on element content – even across element boundaries – preserving well-formedness of documents throughout. Also included is our new, sophisticated grouping specification method based on the painter metaphor. upCast RT features an improved version of the highly respected RTF import engine as known from earlier versions of the application. It enables you to use Microsoft Word as an authoring application for XML documents. Take advantage of the widespread availability and familiar user interface of Word or any other RTF savvy office application for structured document authoring. upCastRT offers a cost-effective way to reuse existing tools for gaining all the benefits of a standardized markup language: XML. Also available is the RTF generation module downCast that lets you transform XML documents to RTF. Structuring RTF constructs are used wherever possible like native tables, character and paragraph styles derived automatically from the CSS stylesheet, native lists, headers, footers, textboxes, footnotes or annotations. Of course, standard modules like XSLT processing (incl. XSLT 2), XML encoding and entity conversions, commandline tool integration, document validation are supplied.